Which mainstream news headlines grab your attention first: Scary, alarmist news, or inspiring/neutral stories? What about recruitment related headlines? In mass-media news reporting, frightening and depressing news seems to grab our attention—and more of it, along with more space, than uplifting news. Is that because of some human instinct, the Zeitgeist of our age of anxiety, a ruling-elite and mass-media agenda or because news media are convinced we feel bad news is more important or fascinating than good news? Imagine two headlines: “Recruiters Live Longer than Everybody Else” and “Recruiters Are Dying Younger than Everybody Else”. Or, how about “Recruiters’ Average Salaries to Soar” vs. “Recruiters’ Average Salaries to Plummet”? If you could read only one in each pair, without knowing how well-supported the research is, which one would you chose to read? I’m betting it would be the gloom-and-doom headlines. Forget what I think. Mainstream media seem to think you’ll choose the story with the scarier, bad news headline. For example, on October 29, 2012, the Fox News “Latest News” stories list comprised 16 reports, 12 of which being about “bad and/or scary things”, e.g., cannibal cop, murderous nanny, abusive scoutmaster, fighting in Syria and death of an author. In addition to lopsidedly reporting bad and scary things, Fox and many other mainstream news media consistently focus on “rogues”—scary or bad individuals, as opposed to ominous economic trends, excessive manipulative corporate influence, urban decay, vanishing water, public health problems, rogue organizations (both private and governmental, e.g., shadowy military-contractor agencies), bad legislation, scary ideologies, military-industrial-financial collusion, dangerous technologies, environmentally polluting practices, ominous demographic trends, global warming and/or cooling, risky scientific research (e.g., GMO), to name but a few. Now why is that, if not to make it seem that most of the problems of the world are caused by scary rogue individuals rather than by more powerful, even scarier forces, e.g., sinister groups, organizations, cartels or rampaging, vengeful Mother Nature? November 1st was even more of the same—14 out of 16 stories were obviously negative news, with only one being clearly positive—a story about a poker-winning millionaire. An ostensibly uplifting story about an abandoned baby being found alive actually has horrible negative implications about some evil rogue individual’s (or couple’s) parenting. Likewise, a karate expert’s pounding of an intruder, however inspiring, calls attention to the rogue intruder and the menace out-of-control individuals (rather than out-of-control spending). Yet, perhaps because the entire recruiting industry runs on hope, the bulk of recruiting news is either matter-of-fact neutral or positive. Of the 16 news articles posted at Recruiter.co.uk, not one was negative. Here at Recruiter.com, 4 out of 20 headlines reviewed had some negative tone—but mostly related to employee layoffs and unfavorable shifts in business trends (which reflect simple facts of life, such as “shifts happen”). 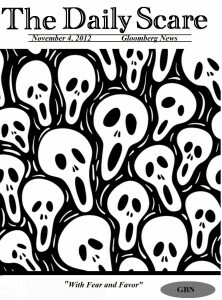 Not one was a real horror story (although one Recruiter.com feature article, 4 Hiring Lessons From Horror Movies by Sajjad Masud, calls attention to analogies between Halloweenish horror movies and recruiting). Why So Much “Gloomberg News”? Common sense suggests this is so and as it should be. That’s because failure to be vigilant for and about a danger will, in general, be more catastrophic for any living thing than failure to pay attention to an opportunity. Overlooked dangers, virtually by definition, tend to have immediate bad consequences, whereas missed opportunities offer a “grace period” before the costs of the lost opportunities. A seal failing to notice the polar bear closing in as it closes in on a fish may pay for seizing that opportunity—with its life. To get a feel for this difference in human terms, imagine a Neanderthal who chooses to seize the opportunity to mate beneath towering ferns rather than to keep an eye on and two feet ready to flee “Soto” the “Ice Age” saber-toothed tiger he hears hidden in other ferns. In this instance, the choice may come down to attending to the danger of immediate annihilation in the jaws of the saber-tooth, or the delayed danger of dying without progeny later, as a result of having missed the Neanderthal maid in the forest mist moment. In its simplest terms, this is an instance of choosing the risk of eventual genetic annihilation in preference to immediate as well as genetic death. 2. The Math of Fear: Mathematics also suggests the same thing: In my article “The Simple Math Underlying Why We Hate to Lose”, I use very basic arithmetic to demonstrate that, in general, the prospect of not losing any amount of money means more to us than the prospect of gaining the same amount. Translated into a bad-news and fear news model, this means that we are more likely to read articles that alert us to feared losses than imminent gains, when those losses and gains are the same size. 3. Mass-media “circus-and-dread” manipulation: Roman emperors lulled and appeased the masses through a “bread-and-circus” strategy of gladiatorial distraction, entertainment and conditioning to accept violence and displays of imperial power, combined with their equivalent of food stamps. The stadiums and their design have changed considerably since then, but the ultimate name of the game and the underlying designs remain eerily similar: Keep the masses focused on dangerous Coliseum “heroes” and “villains”—“rogues of the State”, so to speak. Hollywood themes of individual rogues, psycho loners and outlaw heroes reinforces the message of danger with the trope of the dangerous individual and stranger-danger (which is a very effective deterrent to mass collaborative demonstrations and crusades with other “strangers”). This strategy taps into whatever instinctive preoccupation with dread that is innate in us. It also takes advantage of the possibility that the humanist psychologist Abraham Maslow was right: at the base of our pyramid of needs is the need to feel safe (comparable to whatever need we have to feel safer than the other guy, including the less lucky—and to feel good about that). On this hypothesis, our susceptibility to bad, scary, alarmist news doesn’t have to be and isn’t completely innate: Its’ bred into us by mass-media programming as part of our brainwashing to keep us compliant and apart. Recasting, in terms of fear, Voltaire’s aphorism about God, “If it did not exist, it would be necessary to invent it.” So, one way or another, we will always live and read in fear and gloom. Do you find such thoughts frightening and gloomy? Good.